Whey protein 4.4 lb rich milk chocolate sets a higher benchmark of performance for protein supplements. Consumers aiming for muscle gain should mix 1 scoop (33g) in 180-210 ml water and take 1-2 shakes per day. 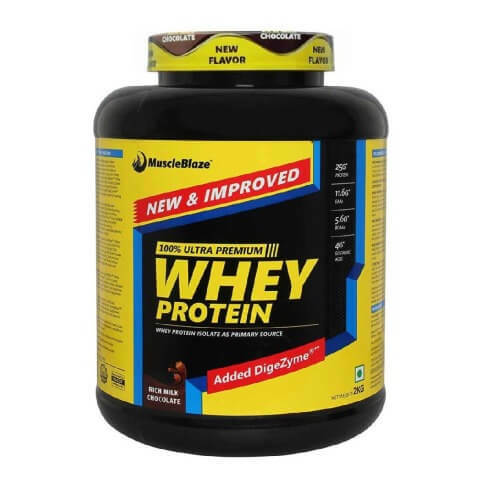 Whey protein Isolate, the major ingredient also considered the most superior form of protein is the primary source of protein with Whey protein concentrate as the secondary source. The potent BCAAs leucine, isoleucine and valine help reduce fatigue, enhance muscular strength and ensure swift muscle recovery. To Recieve updates and possible rewards for MuscleBlaze 100% Whey Protein please sign in. To Recieve updates and possible rewards for Diet Supplement please sign in.